A flying visit back home over Easter gave me chance to connect with a female Common Scoter and the wintering drake American Wigeon, both in West Yorkshire. 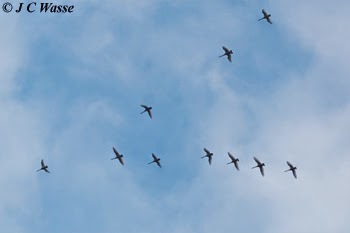 The latter at Swillington Ings where I was lucky to see a flock of 20 Whooper Swans in flight heading west in the evening of 04 April 2015, presumably on their way to Iceland. A nice flock of 35 Sand Martins flew over just before dusk on the same date, but neither Iceland Gull nor Glaucous Gull, seen by others on site earlier, were present in the evening gull roost. Birded the South Yorkshire moors with my dad and saw 3 Mountain Hares on Pike Lowe (scoped from Midhope) and lots of Common Buzzards ranging from Langsett down to Strines. 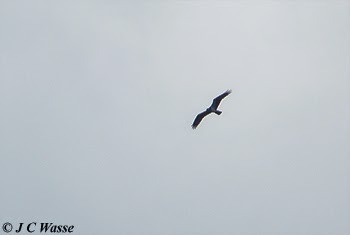 Finally after many hours of watching I found a passage Osprey over the moors in Derbyshire. The Osprey powered its way north through Howden Reservoir during the morning of 07 April 2015. The Midhope Great Grey Shrike decided to vanish over the Easter period and it resurfaced on the day of the Osprey, but we missed it by less than an hour around lunchtime. Snipe drummed and chipped on the moorlands which held a sizeable flock of 500+ Golden Plovers at one location, One bird in display flight down the road at Cowell Flats as well. 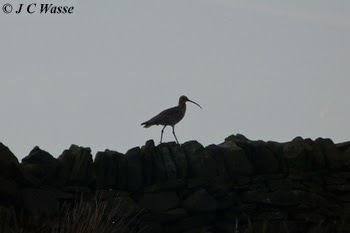 The ringing notes of 'bubbling' Curlews dominated the moorlands as did calling and parachuting Meadow Pipits. Chiffchaff's called throughout and Swallows were back around moorland farms on 07 April 2015. Back at Rainham Marshes RSPB, London on Saturday 11 April 2015 and the highlights were an immature Spoonbill on the Target Pools, a pair of Garganey, singing Willow Warbler and Blackcaps, and more surprisingly a 'wintering' Jack Snipe still present. It showed fairly well from the southern boardwalk mid afternoon. More photos from this period now in the 'Latest UK Bird Photos' area. Enjoy.